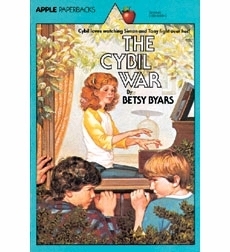 The Cybil War is an Apple paperback published in 1981. The story is that of an elementary school love triangle wherein best friends Simon and Tony fight to win the affections of their classmate, Cybil Ackerman. Simon has been in love with Cybil since she was kind to him after his father moved out, but Tony, a notorious liar who isn't even allowed to attend his own sister's birthday party, is in it more for the competition. Cybil herself is more than worth the fight - she's smart and generous and compassionate, and possesses an inexplicable ability to rise above the antics of her classmates, even when they aim to hurt her feelings. Though the right choice for Cybil is pretty clear early on, it's still fun following the story to its satisfying conclusion. I think this book captures the feelings of early crushes in a very innocent and pure way. There is no real romance in this book; rather, the love Simon feels for Cybil is a very noble form of admiration where he regards her with awe more than anything else. There are some references to dating, which, even 20 years ago, was not something that happened among elementary school kids I knew. There was some "going out" but that usually just meant holding hands and spending recess together, not going to the movies, as they do in this book. The storyline matches up better with sit-coms about school life than it does with real life. Maybe kids went on dates in 1981, but it seems like it happened much more in pop culture than in reality. The book also includes a pet show, which is definitely the kind of thing I think kids dream of having, even if they never actually do it. I can still imagine that piece of the story taking place in a contemporary book. Because this book is by Betsy Byars, I expected it to be well-written, and I was not disappointed. I was also pleasantly surprised when I realized the book is still in print and available as an e-book! It's one of the few books about love that can appeal to boys or girls - and maybe even more to boys, given the male friendship at the center of the plot. The cover could use an update, but otherwise, I think the story is a perfect choice for fourth-, fifth-, and sixth-graders who are taking their first tentative steps toward finding love. 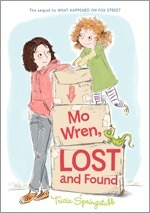 Mo Wren, Lost and Found is the sequel to What Happened on Fox Street, and it sees the Wren family beginning its new life in a new part of town. Dad works hard to make his dream restaurant a reality, while Dottie adjusts surprisingly well to life in a new school. Mo seems to be the only one who is lost, as she copes with being away from Da, Mercedes, Pi, and everything else she loved about Fox Street. Like the first book, this is a very introspective title, where much of the action of the plot takes place inside Mo’s mind, as she deals with her feelings on various topics. Her new neighborhood is filled with interesting people, each of whom, over time, becomes important to Mo, even in spite of her objections to the move. I don’t know if the book really covered anything new as compared with the first book, but I did enjoy finding out what happened to the Wrens and seeing how things ultimately turned out for all of them. A pet lizard, a used sweatshirt, a curse, and a laundromat also figure heavily into the plot, as does the new family in the house on Fox street, an unusual boy named Shawn, and a surprise snowstorm. I’d recommend this book to readers who enjoyed What Happened on Fox Street, as well as Susan Patron’s Hard Pan Trilogy, and Karen Day’s A Million Miles from Boston, where characters must also deal with major life changes and figure out how to navigate adult problems. Clay Hensley is always in trouble. He likes the attention it gets him at school, but more than that, he likes having tales of mischief to tell his older brother, Mitch. Mitch has just spent some time in jail, however, and when he comes home, he starts getting on Clay’s case, asking him to work on his behavior and promise not to get in so much trouble anymore. Clay would do anything to please his big brother, but is it too late to make such a drastic change? This school story by the master of contemporary school stories addresses an important topic in a straightforward, entertaining, and positive manner. Though Clay is difficult to discipline in school, and has a tough relationship with the principal, he’s also a talented artist whose abilities are recognized by the art teacher, and possesses an interesting personality, whose merits are recognized by the principal’s secretary. Though Clay isn’t headed down a very promising path when the book begins, he still has a lot going for him, which makes the reader sympathize with him and hope for his success. Clements’s story does clearly have a moral, but it doesn’t come across in a preachy way. Clay makes his own decisions every step of the way, and it’s through his feelings that the reader comes to understand the importance of cleaning up his act and not winding up in jail as his brother did. 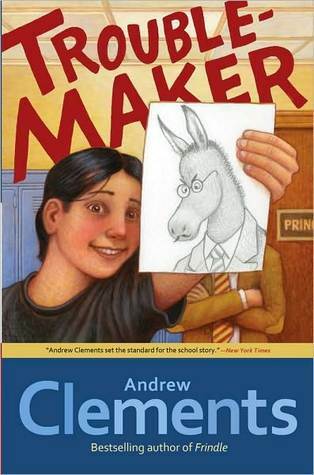 I’m not sure this book alone would be enough to convince a kid who acts up in class to reconsider his behavior, but I do think the story gives well-behaved kids some insight into the minds of those troublemakers they know in their classes. Ultimately, the story demonstrates that no one is ever just one thing, and that each of us is the master of our own destiny. In addition to Troublemaker, I'd also recommend checking out Dexter the Tough, a chapter book by Margaret Peterson Haddix which covers very similar subject matter. 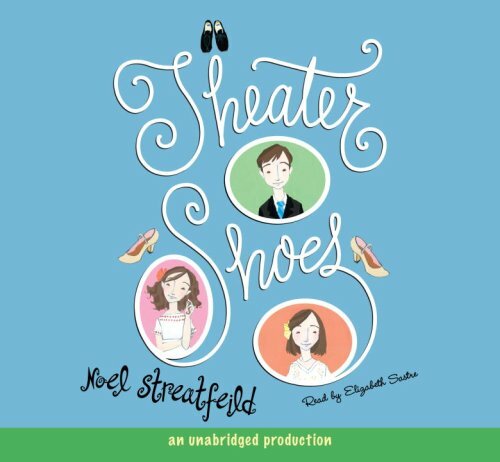 Theater Shoes is Noel Streatfeild's fifth book for children, and it was originally published with the title Curtain Up in 1944. Though it came out eight years after Ballet Shoes, it is essentially a sequel, focusing on the same dance academy at which Pauline, Petrova, and Posy Fossil studied in the 1930s. The main characters of this story, Sorrel, Mark, and Holly Forbes, are the grandchildren of a famous actress and also the beneficiaries of scholarships funded by the three Fossil girls, (who are now quite grown up and doing very well for themselves, despite the hardships of World War II.) Favorite characters from Ballet Shoes, including Madame Fidolia, Miss Jay, and Winifred, figure heavily into this story as well, but the Forbes children are very much their own personalities, and their yearning for their father who is missing in action, their uncertainty regarding their strange grandmother, and their rivalry with stuck-up cousin Miranda are the driving forces behind the plot. Though there are many similarities to the formula used to write Ballet Shoes, this book is also its own entity, with its own strong characters and narrative voice. This book was not historical fiction when it was published, as much of it takes place in 1943, just one year before its publication, but it reads as such today. References to bombing in London, to coupons used to buy things, and to the military men for whom the children perform concerts embed the story firmly in the time period and actually do quite a nice job of illustrating World War II England for today's children, in terms they can understand, and in a way that makes the historical events mentioned accessible and interesting. I think this book is also a bit more believable than Ballet Shoes. Ballet Shoes reads more like a fairy tale, with all these improbable twists and turns leading the Fossils to great fame. The Forbes children are more down-to-Earth, and their experiences more realistic, and more likely. Sorrel, especially, felt like a very real girl with real flaws and concerns. It was easy to put myself in her place and imagine the world of the academy, and Miranda's snobbery, from her point of view. Mark, too, was an interesting addition to the story, because he introduces a male point of view and represents a segment of the population - male dancers - which is often ignored by children's fiction. Of the three, only Holly seemed a bit flat, almost as though she provided comic relief and not much else. Another thing that made reading this book so enjoyable was that I listened to the audiobook, which is narrated by Elizabeth Sastre. She also narrates the version of Ballet Shoes which I listened to and I can't imagine anyone else doing a better job. She introduces these subtle nuances of personality just in the voices she uses for each of the characters. Her accent is also very easy to understand, but immerses the listener completely into the way English is spoken in England, which is important to the overall appreciation of this book. This is one of the older books I've blogged about, but it's one of the ones that holds up the best. The drama between Miranda and Sorrel reads like many tween novels being published today and definitely zeroes in on the kind of friendship stories girls in the middle grade age range love to read. It's also a great choice for girls who are not yet into romance and dating, but instead like to read about girls having life experiences, spending time with their families, and working hard at becoming better performers. First of all, Babymouse is not a baby. I honestly wish I'd paid more attention and picked up on that fact sooner, because it would have made me much more interested in reading this series. 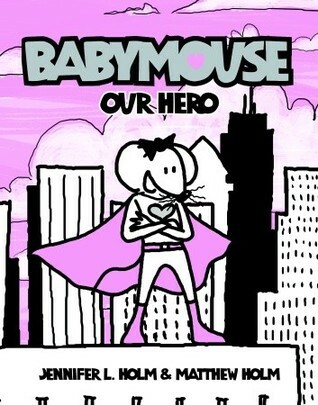 As it turns out, Babymouse is in middle school and has a bit of a middle school attitude. She dislikes school, has an active imagination, and frequently spouts the pessimistic phrase, "Typical," when something doesn't go her way. She reminds me of AJ from the Weird School books and even a little bit of Junie B. Jones. I understand now why she's so popular. The illustrations in the Babymouse books are somewhat similar to those in the Fashion Kitty series in that they are entirely pink and black. From what I can gather, though, the pinkness of the books doesn't turn off boy readers. In fact, I think Babymouse's attitude and the graphic format of the books draws in boy readers, especially reluctant ones. The narrator is a character in each book. As in Disney's Winnie-the-Pooh, the narrator tells the story and also interacts with Babymouse, arguing with her and sometimes poking fun at her in a somewhat ironic tone. Because of this relationship with the narrator, I kept thinking of Babymouse as a grown-up version of the mouse in the The Little Mouse, The Red Ripe Strawberry, and the Big, Hungry Bear. The tone is very similar. Whereas the Fashion Kitty books are more about girl power, Babymouse is more about relating universal middle school experiences in a funny way. In that sense, the series compares well to Amelia Rules, where the characters also use their imaginations to combat life's difficulties. Funny visual gags really add to the universal appeal and make the mundane seem interesting and adventurous.